Today Latest Newspaper Cutting Job Update Date 08-10-2017: GujaratJob Is Dailly Update Latest Gujarat & India Level All Types Government Jobs.Today Latest Job Update.We also Updated Various Exams schedule. Also Answer key, Result, Merit and Selection Lists. Today Latest Job Update Date 08-10-2017. 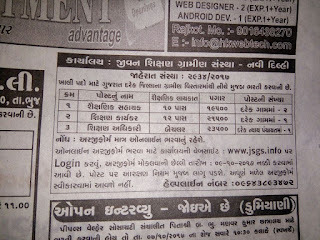 Gujarat all newspaper Sandesh news, Divya Bhaskar, Gujarat Samachar, Nav Gujarat Samay All job cutting here.